When I got my first job in a coffee shop I thought, “I like coffee, that machine looks fun – how hard can it be?”. I was more worried about burning the food in the café or how I was going to amuse the scary looking emo teenagers in the corner than what sort of coffee was going to go into that strange noisy hopper on the worktop. I’d used the coffee machine when I worked in the pub; it involved sticking a cup underneath and pressing a button. I could cope with that. All would be well. That was 2006, and in the last eighteen months my views on these things have changed a great deal, especially after my experiences over the last few days. 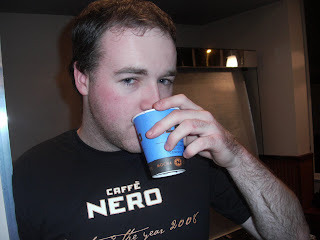 Caffe Nero, according to their website, pride themselves on their coffee, referring to ‘the art of the barista’. All employees – baristas – ‘undergo days of intensive training before being allowed to serve an espresso.’ When I started working there, I can’t say I much noticed the intensity of the training; I had already done some barista training at Pumphreys Coffee House for my previous job, and as such, assumed I knew what I was doing. 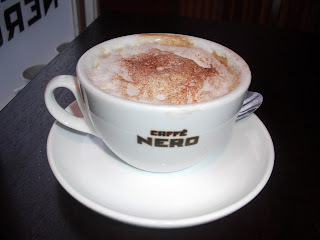 All I had to learn now was how to make coffees ‘The Nero Way.’ It is fair to say that everything in Caffe Nero is branded somehow, even down to the exact proportions of foam, milk and espresso that go in to the cappuccino. You can’t just serve ‘any’ cappuccino, it has to be a Nero Cappuccino, and as petty as it sounds, there are some glaring differences. These differences become very apparent when it came to Barista Championship competitions. The Speciality Coffee Association of Europe hold regional and national competitions for baristas to show their skills and compete for a place in the World Barista Championship. Last year’s World Champion barista was James Hoffman from the UK, who luckily for me, happened to turn up at Pumphreys Coffee House when I trained there. I met a coffee celebrity! He was also one of the main judges for the UK regional finals this year. The competitors in these Barista championships took the event very very seriously, and not just because of the cash prize and prestige on offer for the World Champion. This competition is a culmination of a lot of practice, a lot of skill and a lot of hard work perfecting what is essentially an art form. 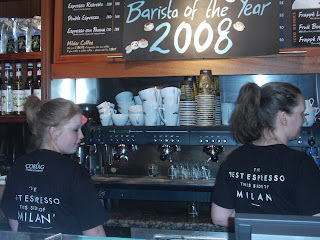 Meanwhile, Caffe Nero also hold their own Barista of the Year competition. The northern heat was held in Newcastle on 22nd January, and I tagged along to support some friends and former colleagues. 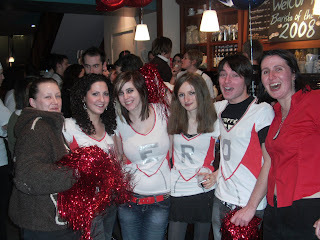 Although the area manager described the event as ‘a bit of fun’ and the sheer quantity of free beer, the cheerleading efforts and the ‘Prize for Best Team Song’ seemed to demonstrate this, the specially made t-shirts saying “Barista of the Year 2008 Finalist” on them, and the prizes – a trip to New York and a chance to meet Nero CEO Gerry Ford – suggested that the competition did have a serious side. In the northern region, there were thirteen competitors, representing the Nero stores in Durham, Darlington, Ripon, Gosforth, Newcastle, South Shields, Berwick and Hexham. 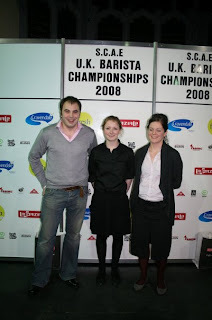 Each store manager had put forward one or two baristas judged to be the best in the team. Their efforts were judged by regional managers and Nero ‘Coffee Maestros’ from other parts of the country. The Newcastle Caffe was not exactly a huge venue, and so only two baristas could compete at once, using different sides of the same Gaggia machine. Each side had two double handles, a grinder and a milk wand, and so technically speaking each barista could have potentially made four drinks at once. But as the area manager, Kirsten, announced beer bottle in hand: “Please don’t use the second handle on the left for espresso, its a bit dodgy…” Since espressos are the basis for all the drinks made in the competition, this should have been a bit of a hindrance, but it didn’t seem to make any difference at all! The first two rounds were timed; the first challenge was to make a cappuccino, a latte and a single espresso shot in three minutes. The second was three medium cappuccinos in four minutes. After judging each, competitors with the least points, or those who ran out of time, were eliminated. Eventually, it was down to four baristas, Michael from Ripon, Frost from Gosforth, Becky from Hexham, and Steve from Durham. These four then had to make another series of drinks, this time without being timed. They just had to make the best drinks they could. From these, the judges picked the final two, Michael and Frost. The final round was to make a hot chocolate, a mocha, a latte and an espresso. After four attempts at his espresso, Frost eventually won the competition, and crowned the Northern region’s Barista of the Year. Celebrations were very noisy, but only Steve from Durham seemed remotely gutted about losing the chance to meet his hero, the enigmatic Gerry. More significant from the point of view of a trainee barista, was why Frost won. The judges were looking for various aspects of Nero coffee making, but not all of them immediately obvious. The emphasis of the competition was very much on Nero-ness – a bit of fun to get all the teams socialising together, but also more subtly, to reiterate the brand. One of the qualities of a good barista at Caffe Nero is the possession of good customer service skills, and a happy barista who is having fun is generally better at serving customers. More specifically, a happy barista who can make good coffees consistently, repetitively and very quickly is even better for the company. The point of testing competitors’ ability to make three cappuccinos in four minutes was to see if they could actually keep it up – anyone can make one decent cappuccino once, but it takes some skill to do it over and over again during an eight or nine hour shift, while maintaining a sense of humour. As mentioned before, a Nero Cappuccino is a very specific thing as well. In a 15oz cup, there is supposed to be double shot of espresso (1/3 of the mug) one third hot milk, and one third dry milk foam. And chocolate on the top. In this case, Caffe Nero HQ tends to be fiddling while the cappuccinos burn. What shocked me, even though I know the company pretty well now, was that the judges did not even bother to taste the coffees made. 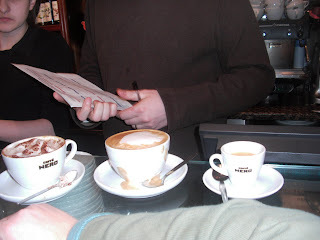 The cappuccinos were poked to test the depth of froth, lattes were stirred to check consistency, and the espressos were timed to see if they poured for the correct 15 seconds (which would be woefully underextracted in any other circumstances). But no one actually tried them, there was no test of flavour. They just had to look right. 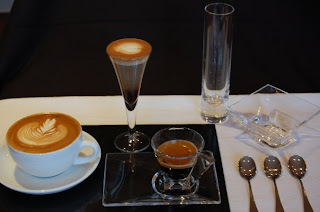 However, it is very possible to make coffees that look great but taste foul, so I asked why they weren’t tasted and was told there was no need; the judges could see how well it was made anyway. “It’s not the Barista’s fault if the coffee isn’t good.” This worried me a great deal. If the coffee itself ‘isn’t good’ then this doesn’t say much about Nero as a company: area managers do not even believe their own marketing. More to the point, the very people in charge of judging the standards of drinks for the whole company are seemingly unaware that even if the coffee itself is high quality, it can still be ruined by being prepared badly by the barista. Coffee is NOT “just coffee”, cappuccinos should not be made just to look pretty, and it is very disappointing to think that the brand that got voted the UK consumer’s favourite for the past seven years still thinks like this. To make sure, I went round sneaking mouthfuls of everyone’s attempts whenever I could. Some were very much better than others. However, none had anything like complexity that I was to experience the next day. The very next morning I eventually got myself to Edinburgh to see the Scottish heat of the official UK Barista championship. This was a much more serious affair. Fourteen competitors throughout the day, four ‘coffee’ judges including last year’s World Champion, and two technical judges, testing the way the baristas used the machines. Anyone could put themselves forward for the competition as long as they had two years experience in the industry, and you competed as an individual not as a representative of a particular company. Apart from the fact the whole event was sponsored by La Spaziale who make the espresso machines, it was relatively devoid of commercial propaganda. More interestingly, not one of the entrants in this heat came from a big chain coffee shop – no Nero, Costa or Starbucks baristas here. 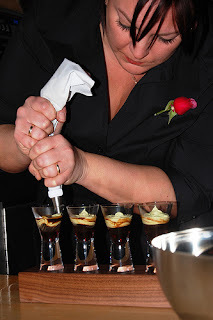 Every competitor had the same task – to make four espresso shots, four cappuccinos and four of their own speciality drinks inside 15 minutes. They could use whatever blend of coffee they liked, and most took the time to explain to the judges what they were using and why, showing that they really actually knew the blend. Interestingly, one entrant, Andrew Mundy, used a single estate coffee from Cachoeira Fazenda, or Waterfall Farm in northern Brazil. Cachoeira Fazenda has won a great many awards, and is apparently one of the ingredients in Caffe Nero’s house blend, implying that Caffe Nero coffee really shouldn’t be dismissed so easily. The four judges probably suffered severe sensory overload by the end of the day, having to taste three drinks from all fourteen competitors. They gave marks out of six for the taste and balance of the espresso, and the ‘tactile balance’ of it, how full bodied it was for instance. The cappuccinos were again graded on balance and consistency, but also temperature so as they were not too hot to drink like at Nero. 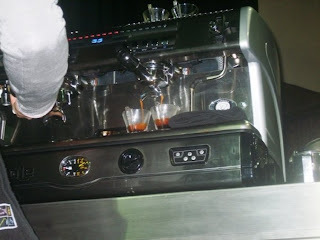 Finally, the signature drinks were graded on flavour and also quality of the espresso base. Baristas also got points for technique and use of the machine. They were penalised for wastage – grinding too much coffee, or frothing too much milk, or even pouring away spoilt drinks, not that anyone needed to. They also lost points if they went over the fifteen minutes performance time. Personally, I loved the signature drinks. By far the best part of the day from the audience’s point of view was the fact that after the judges finished their analysis, the drinks were passed round for the rest of us to try. The signature drinks could be anything that involved espresso, that could be made inside the allotted time, and did not involve alcohol. My personal favourites were the truly bizarre ones: ‘Sun, sea and sand’, by Paulo Tanzillo involved risotto rice in the bottom of a glass, with espresso poured on the top, and finished off by topping it with a bright yellow cream made of whipped egg whites and lemon juice. It tasted a bit like bitter lemon meringue pie! Others included Leo Ventisei’s ‘Agua Dulce’ which was espresso with a slice of crushed lemon in the bottom and the glass crusted with sugar, it tasted stupendously good in my humble opinion. Kirsten Olsen made a drink inspired by the coffee’s origins – Brazilian, and mixed her espresso with avocado and lime. David Fraser served his drinks in tiny biscuit barrels, and used blended up ginger biscuits in his coffee. I admit, I was a little disappointed with some of the winners, not because I thought they shouldn’t win, but because they were not the most interesting! Third place went to Agnes from Kilimanjaro Coffee in Glasgow, who made a signature drink infused with orange blossom and vanilla. First place went to Gillian Campbell with her iced drink with orange and chocolate. These were very, very good, if not the most original! However, it was the espressos and cappuccinos that won it – complete with latte art rosettas. Signature drinks are wonderful, but in most coffee shops, standard coffees are the most important thing, and this is recognised even at national competition level. In a totally non-biased fashion, I was very pleased when Stuart Archer from Pumphreys Coffee House in Newcastle came second. Whereas I just got mouthfuls of the other competitors’ drinks to test, I’ve been lucky enough to sample Stuart’s coffee properly outside of competition circumstances, and it is very good indeed. Although he claims he spoilt his cappuccinos, the judges obviously didn’t think so. His signature drink sounded not only bizarre, but pretty disgusting too – espresso infused with garlic, and laced with chocolate. Debating whether to hold my nose first, I tried it, and contrary to expectations, it really worked. The garlic didn’t actually kill the coffee, and somehow brought out its natural sweet smoky taste. Not something I think many coffee shops will be offering on the menus very soon, but certainly an interesting treat. any other industry awards: recognising talent and skill in the particular field, and to reward hard work, or act as an incentive to excel. But essentially, coffee is a beverage, designed for human consumption. The displays of coffee making prowess at the SCAE competitions are artistically and creatively excellent, but these are not the sort of drinks you will get served at an average coffee shop. In short, they are not actually designed for regular consumption – at most, they are a luxury afforded only to those who bother to seek out the independent coffee shops that serve speciality coffees and employ world class baristas (which are few and far between in this country). At worst, they are art for art’s sake, and remain relatively unconnected with the regular coffee shop industry as a whole. As former UK Barista champion, pointed out: “The British are at the ‘Blue Nun’ stage of coffee drinking.” Put more simply, we are not yet coffee gourmets, and in this country there is little place in the market for such luxury, and elitist, drinks. Caffe Nero, in comparison, may not take the idea of barista awards so seriously, and may not be judged by the same standards, but the coffees made in the competition are exactly what the customer will receive when they visit a Caffe Nero store. This cannot be said of the SCAE competition. The Nero awards are designed to uphold their own standards throughout the company, and to reward talented employees, which it can be argued, is a much more practical reason for holding the competition. 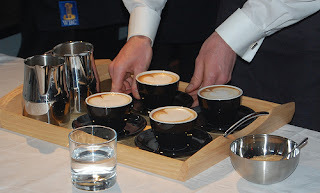 There is no doubt that the coffees at the SCAE competition were of much higher quality, but there is also no denying that it is Caffe Nero and similar chain stores that are the most successful and profitable, and not the independent cafés. In the current climate, it is the chain stores that are actually supplying what the average consumer really wants.